The concept, structure and research methodology of Architecture of Embodiment, as well as specific aspects of this research environment, are publicly presented in various formats. The aim of these presentations is not so much to inform, but rather to create situations for collective reflection. These presentations allow for a critical approach to the research process from a distanced point of view, and thus complement the close interaction the research cells require. On June 18 2017, the first three books published in the research environment Architecture of Embodiment—transient senses, Architecture without Walls and Klangumwelt Ernst-Reuter-Platz—were presented in the context of A Dialog on Artistic Research in Architecture with the participation of Alex Arteaga, Brandon LaBelle and Lena Kleinheinz. This event took place at Errant Sound, a sound art project space in Berlin. 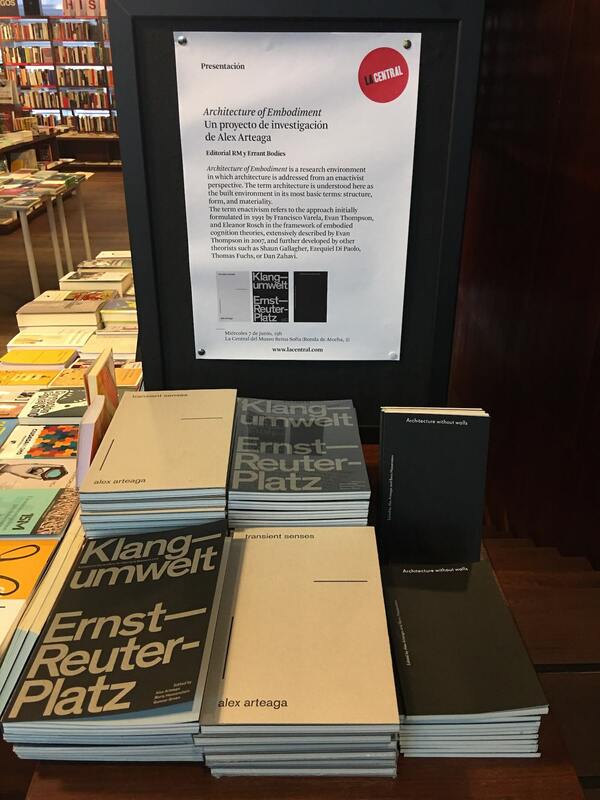 On June 7, 2017 Alex Arteaga presented the first three books published in the framework of Architecture of Embodiment—transient senses, Architecture without Walls and Klangumwelt Ernst-Reuter-Platz—at the book shop La Central (Museo Reina Sofía). The book presentation was framed by a dialog with Laura Martínez de Guereñu and Jacobo Fritz-James Stuart on the social function of architecture and aesthetic research, moderated by Jose Luis Espejo . On May 5, 2017 Alex Arteaga presented the first three books published in the framework of Architecture of Embodiment—transient senses, Architecture without Walls and Klangumwelt Ernst-Reuter-Platz. The presentation took place at the Angewandte Innovation Laboratory in the framework of Publishing in the Context of Artistic Research, a side event of the Public Colloquium of the Angewandte´s Artistic Research PhD Program. Other participants in this event were Alexander Damianisch, Nikolaus Gansterer, Emma Cocker, Mariella Greil and Lilia Mestre. On March 1, 2017 the book transient senses was launched at the book store múltiplos in Barcelona. The presentation consisted of a dialog with the book’s publishers Anna Ramos (Fundació Mies van der Rohe) and Ramón Reverté (Editorial RM) about the function of books in processes of artistic research. 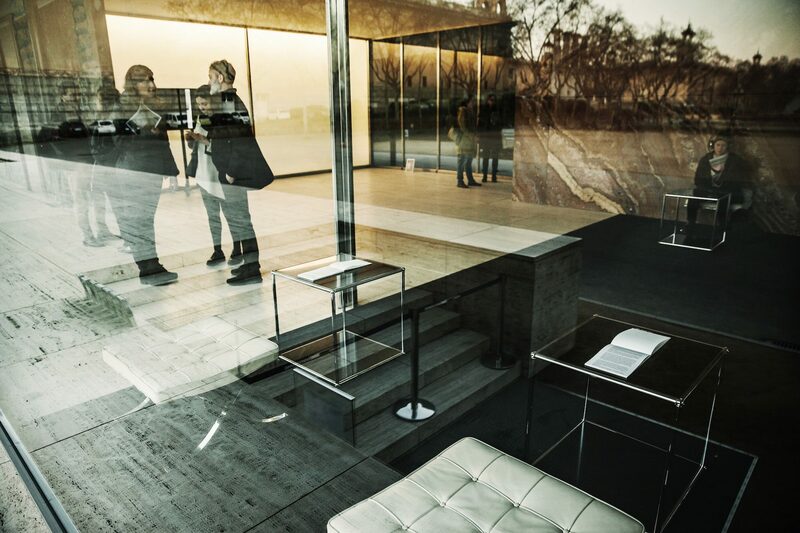 From March 2 to 5, as an extension of the book launch, the text, video and sound essays that configured—together with a sound installation and a research seminar—the project transient senses were exhibited at the Barcelona Pavilion. On March 10 at La Virreina a dialog between Alex Arteaga, Alexander Damianisch, Enric Llorach and Gerard Vilar entitled Knowledge and Aesthetic Practices: a Debate on Artistic Research was the frame to present two other books published in the context of Architecture of Embodiment: Architecture without Walls and Klangumwelt Ernst-Reuter-Platz. In the lecture Architecture of Embodiment Alex Arteaga presented the first results of this research environment alongside the research cells near(ly) sounds. Bauhausgebäude, transient senses and emerging environments. Tabacalera. This lecture was given on March 17, 2016 at the School of Architecture, Design and Conservation at the Royal Danish Academy of Fine Arts within the framework of its International Lecture Series and in cooperation with the Copenhagen Architecture Festival. Auditory Architecture was a lecture given by Alex Arteaga on March 16, 2016 in the framework of a symposium on sound and architecture organized as a part of the Copenhagen Architecture Festival. In this lecture, Alex Arteaga presented the conceptual and methodological foundations of the Auditory Architecture, a new approach to the relationships between aurality and environment developed at the Auditory Architecture Research Unit (Berlin University of the Arts). Thinking the Environment Aurally. An Enactive Approach to Auditory-Architectural Research and Design was a lecture given by Alex Arteaga on July 19, 2014 in the Architecture and Urban Planning section of Invisible Places, a conference on sound urbanism and the sense of place. The lecture was structured in two parts. The first introduced the most relevant concepts of the enactive approach to cognition implemented by the Auditory Architecture Research Unit for the auditory research and design of architecturally conditioned environments. The second part outlined the research and design practice of auditory diagramming, which was also developed in this research unit. For a first description of this practice see the book Klangumwelt Ernst-Reuter-Platz. Kunst als Zugang. Ansätze einer ästhetischen Phänomenologie (Art as Access. Approaches to an Aesthetic Phenomenology) was a lecture given by Alex Arteaga on June 13, 2014 during the Nacht der Philosophie (Night of Philosophy) at the Institut Français in Berlin. The lecture briefly summarized some basic reflections on perception and its experiential substrate, and considers aesthetic conduct and aesthetic practices as ways of accessing this substrate. The necessity of an aesthetic extension of the phenomenal method was posited on this basis. On March 4, 2014, Alex Arteaga presented the research environment Architecture of Embodiment to a group of architects, artists, and researchers from different disciplines at ArkDes (Swedish Centre of Architecture and Design). The presentation was not conceived as a lecture but rather as a short workshop that allowed the critical revision of central concepts of the theories underpinning this research environment—phenomenology and enactivism—as well as its main questions, structure, methodology, and goals. Although the presentation took place a few months after the start of this research project, it was very useful as a first public evaluation of the project’s main constitutive elements.